Welcome to Tupelo County, Georgia, where even the local Easter egg hunt takes on legendary, Super Bowl proportions. In Father, Son & Holy Coach, Friday night football is the motif that illuminates a father/son journey gone off the rails. Over the course of 85 minutes, Posey, who confesses he was shaped by a complex and conflicted relationship with his own father, seamlessly portrays over two dozen different characters — the entire town of Tupelo. Southern storytelling at its best, writer/performer John Posey (How to Get Away with Murder, Teen Wolf) returns to L.A. with an all-new revival of his critically acclaimed comedy about a former small-town football star who attempts to live vicariously through his son. 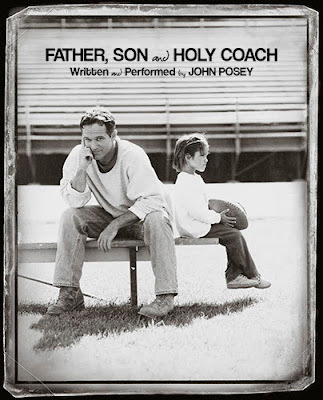 Father, Son & Holy Coach, presented by Rainy Night Films in association with Tyler Posey and directed by Terri Hanauer, opens as a guest production at the Odyssey Theatre on February 13. For tickets, call (323) 960-7724 or www.plays411.com/holycoach.